Welcome to the party, Vanessa. We loved the Scandinavian Christmas Stocking you brought to the party last week! It’s that time of the year again!! The world looks like a twinkling fairy land straight out of hallmark cards and everything seems magical, full of possibilities and hope. Food is definitely on everyone’s mind now and here too we are going to be celebrating all things Christmas! So link up with your best seasonal crafts, food and DIY. Wishing everyone good cheer, good food and great friends! Let’s get this party started. Now come say ‘hello’ to your hosts. And now, getting down to Saucy Saturdays biz-ness, we’re so happy to have you with us again! Don’t forget to follow your hosts and me on INSTAGRAM . Get ready for the shout outs too as we will be reposting some of your posts randomly on our IG feeds!! 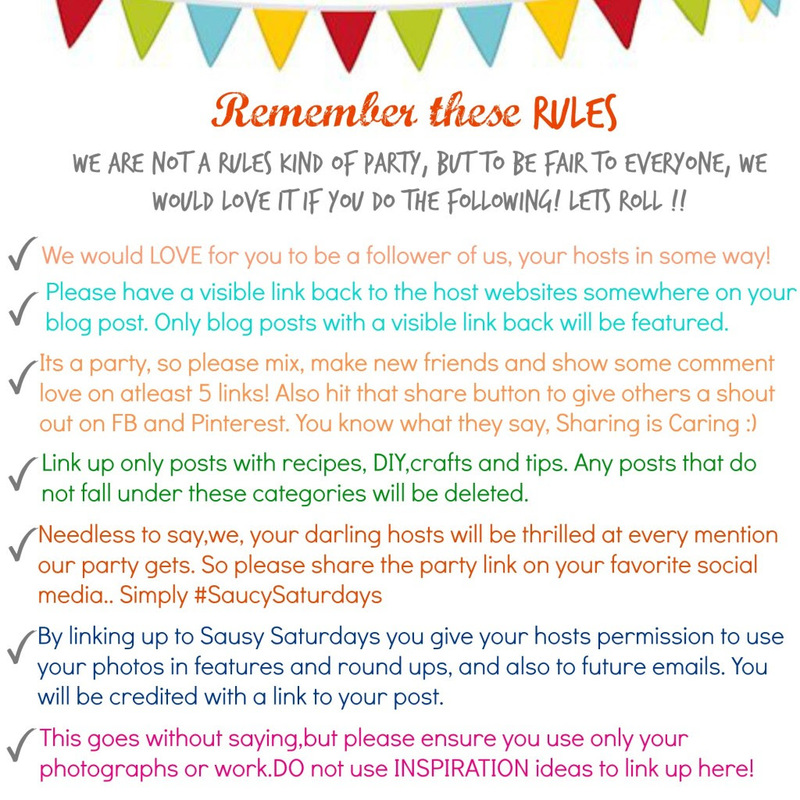 Do join us there and tag us #SaucySaturdays to share your blog hop posts!! We would LOVE it if you guys could spread the word about this blog hop. Simply share on FB, Twitter, or Instagram using the #SaucySaturdays hashtag! Thanks so much for the feature and for hosting as ever! I always love your recipes, Caroline. Thanks for coming!